​My fishing journey started back as a young girl at the age of eight or nine. I fished the river banks and local ponds, many afternoons and weekends with my father. We caught many bass and catfish. I did not have the luxury of riding or fishing in a boat but at that time I didn’t need one. We had all the bites and catches that we wanted. I was a little tom boy growing up and I didn’t mind getting dirty. My mother was the one who taught me how to be and act like a lady. She showed me how to clean up after being that tom boy and put on a nice dress. I’m glad she did. It wasn’t until I met Max, husband of twenty-two years, that the bass boat and fishing came back into play. The thought of tournament fishing was the farthest thing from my mind. Max saw on the internet where Women’s Bassmaster would be fishing at Lake Norman, N.C. in July 2006. He encouraged me day after day, week after week, until I finally gave in. I’m so glad I did. I won the Women’s Bassmaster tournament on Lake Norman with a wire to wire win as a co-angler. The Lord put me in the right place at the right time in my life and I couldn’t have done it without him. I have been fishing nationally since 2006 with B.A.S.S., FLW or Lady Bass Anglers Association from the back of the boat and the front. I am a very modest and humble person. I’ve been told that I don’t brag on myself or my accomplishments enough. I do have quite a few accomplishments since 2006. Overall local and national tournaments: Ten first place finishes, thirty top 10 finishes, forty three top 50 finishes. 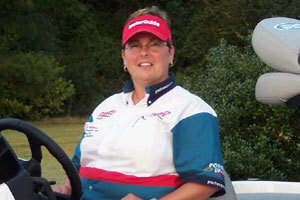 Women’s Bassmaster finishes: Three 1 st place finishes, one 2 nd place finish, and six top 10’s, Co-Angler Runner Up in 2008 and Co-Angler Champion in 2009. Along the way, I’ve won four boats, cash and prizes with career earnings of $142,000.00. My latest career highlight was winning a national Lady Bass Angler Association tournament on Kentucky Lake in July and also receiving Rookie of the Year for 2012. I am so blessed and thankful for every accomplishment. I could not do any of this without the wonderful support of Max and my family, friends, sponsors and fans. A long time of fishing from the back of the boat has given me so much more knowledge than I ever expected. I’ve tried to transform this knowledge that I learned and now move it to the front of the boat. Fishing with some of the legends in the sport doesn’t hurt either. Words can not describe being able to fish with someone you have looked up to your entire life. It’s amazing how much you take in and learn by just watching and listening. Listening is the big key. It’s all about making memories and making friends. It’s nice to know that you’ve grown from this little tom boyish girl into a professional lady angler and mentor for other girls, boys and adults. As long as I live, I will never forget the fishing memories that I’ve had with my female and male competitors, friends, my spouse and my father. ​I am so blessed and thankful for great sponsors like Ranger Boats, Mercury Marine and Motorguide, Humminbird, MinnKota Talons, Anglers Choice Marine, Deep Creek Lures, Capt. Gary’s Bass Boat Instant Shine, JB Custom Rods, Powers-Swain Chevrolet, Enviro Serve Chemicals, Berkley, TTI Blakemore, Pro Chip Finder, Motormate Outboard Locking System, CB’s Hawg Sauce, 2BKOOL Apparel, Mojo Fishing Gear, Vertical Lures and Illusion Baits.